Two of the most beautiful flower varieties are featured in this sumptuous bouquet. This striking partnership of Yellow Cymbidiums and Red Chrysanthemums paired with Flexi grass makes an unmatched floral arrangement. 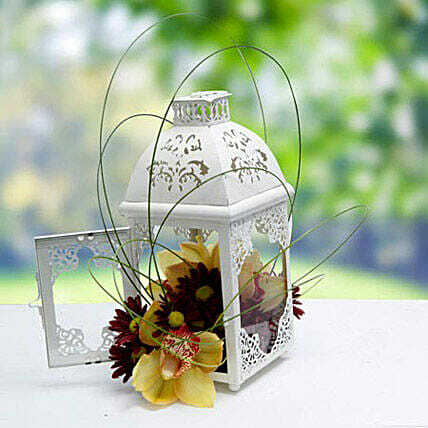 It is adorned with carved Ivory coloured lantern that makes it a magical gift and is both stylish and wonderfully luxurious. Do not fold the card. To prevent the card from getting dirty, always keep it in the envelope provided.